The Hasidim of the Williamsburg section of Brooklyn separate themselves not only from non-Jews and unreligious Jews but also from religious Orthodox Jews whose religious ideology, intensity, and frequency of traditional religious behavior do not meet Hasidic standards. These Hasidim create a sociological wall between themselves and other Jews whom they do not consider traditionally religious. This being the case, how is it the Hasidim are able to survive, indeed thrive, well into the twenty-first century while maintaining their social isolation and avoiding assimilation into the American culture, especially living amongst the cultural and ethnic diversity and temptations of New York City? 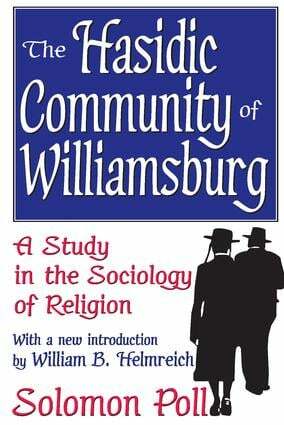 The Hasidic Community of Williamsburg explores and explains this sociological phenomenon.Poll explains some main tenets on the which the Hasidim of Williamsburg have come to rely: making secular activities sacred; incorporating modern devices into their lives to promote and advance their own religious observance; separating themselves, using daily activities including the clothes they wear, the food they eat, the places they gather, and even the language they speak among themselves; and by incorporating American values into their lives while simultaneously casting aspersions on and demonizing all those who do not follow their exact way of life.Until now the Hasidim have successfully achieved social isolation while also continuing to thrive as a group. They have created a well-functioning community with social controls and little or no deviation. However, as the outside society continues to advance and the Hasidim, themselves, further incorporate the very American ideals of hard work, economic success, progress, prosperity, and profit into their own community value system, will their social controls remain effective or become weakened?